Please refer to our stock # 2928/911 when inquiring. 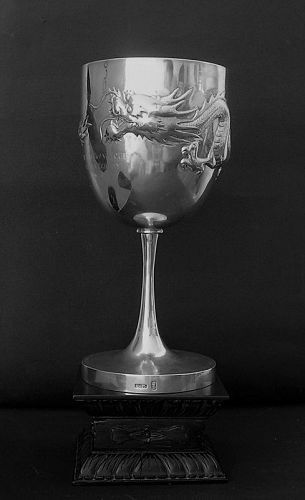 A Chinese silver goblet from the workshops of the renown artist Wang Hing, the body is embossed with a beautifully detailed writhing dragon all around. An elegant and sophisticated composition. The footrim is engraved with " Portsoy Bowling Green 1907 won by William Wiseman" The side of the cup bears the sentence " The Hong Kong Cup presented by W & J ". It is stamped WH90 plus some Chinese characters. It comes with its own custom made hardwood carved stand. size: 28 cm the cup itself. age: C. 1900. condition: very good indeed, no restoration, no breaks.